We recognize the need of our customer to use their heavy machinery as soon as possible after they have bought it. That's why transport is a key part of our full service concept. We offer transport throughout Europe with our own transport fleet and our large network of international transport companies. With our large network of transporters and our own transport fleet are able to transport machinery throughout Europe at very competitive rates. 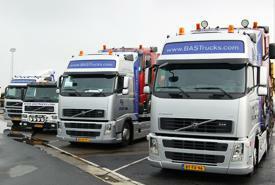 Not only if you buy machinery from us, but also if you need transport of your own machinery. You can always contact our transport department to discuss the possibilities. For the transportation of your machine we try to use our own transport fleet as much as possible. With our flexible planning we can schedule the transport of your machine almost always directly, or whenever you request it of us. Thanks to the high volume we transport every year we are often able to combine cargoes which allows us to offer you the best price for our transportation services. By using our transportation services not only will you save yourself the time and effort to arrange it, but we also guarantee a quick delivery. Without having to worry you can wait for your machine to be delivered. In the meanwhile you will be kept up to date through the "My BAS Machinery" portal. Read more about "My BAS Machinery"
If you want more information regarding transportation of machinery and construction equipment, please contact us by clicking the button below, and filling the contact form. We can also arrange the shipment of your machinery, read more about our shipping services on our shipping page.